Keep Your Jazz Hand Strong, which contains nearly an hour of comedic music packed into 17 satirical songs, is the latest studio album from comedian/musician Rob Paravonian, a performer known the world over for his viral Pachelbel Rant and more. Inspired by a love of 70s soul, with nods to 80′s rock, contemporary pop, classic country and more, Jazz Hand combines Rob’s agile lyrics with catchy hooks and solid musicianship. Recorded in Brooklyn, NY, Rob’s adopted home for well over a decade, Jazz Hand is infused both with classic New York City style–from the opening track G Train to the closing Curtis Mayfield-inspired title track–as well as Rob’s trademark Midwestern affability. With Rob handling everything from songwriting, arranging, performing and production, the album has a cohesive feel and a unity of purpose. From the opening bar of the first track it is clear that rich, full arrangements are on the way. Rob draws on years of playing orchestral and symphonic music as a cellist throughout grade school and high school, and an adult life spent in studios with bands and as a producer. When living in Chicago Rob’s power-pop band The Steppingstones recorded with producer Jeff Murphy (from the 70s-80s band Shoes) and in New York Rob has written and produced theme music and compositions for everything from TV shows to the theme song for legendary Lower East Side performer St. Reverend Jen. Though Rob has embraced the Do It Yourself ethos by recording his last several albums on his own, Keep Your Jazz Hand Strong would more aptly be described as Do It Yourself With Help From Friends and Fans project thanks to a successful kickstarter campaign that saw Rob reaching his funding goal in just 4 days. By offering hand-numbered and signed copies of the CD, as well as exclusive live premiums, Jazz Hand was 126% funded on kickstarter by the end of the campaign, inspiring Rob to add a few more tracks to the album. 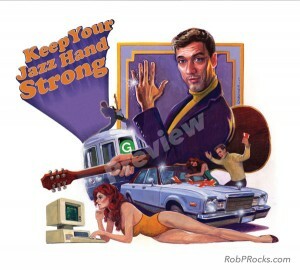 Keep Your Jazz Hand Strong is the fifth studio album from Rob Paravonian and will be officially released in June of 2013. It will be available through CD Baby, iTunes, Amazon.com, and wherever good music is sold.